The Genealogical Proof Standard (GPS) was created by the Board for Certification of Genealogists. It’s used to create sound, credible genealogical proof statements, and gives genealogists a standard to measure conclusions against. Because I love a good visual, I created this process flowchart to walk you through proper genealogical research using the concepts and ideas of the GPS. Note the ‘leaf’ references in the graphic refer to sections of this article that provide additional information and clarification on some of the more complex steps. Get a high resolution version of this flowchart for quality prints. Enter your contact details below to join my newsletter and you’ll get this download link sent straight to your inbox. Would they have firsthand knowledge of the information given? Have you conducted reasonably exhaustive research? “I just found out that I’m descended from King Edward V of England!” your friend tells you excitedly. How do we prove something when it comes to genealogy and family history research? Just how much information and evidence do we need? You might only need one original record containing primary information from a trustworthy informant that provides direct evidence for your research question. Or, it could take many derivative records containing secondary or indeterminable information. When doing any work in genealogy, it’s important to know and understand the differences between sources, records, information, and evidence. The word source is often confused with ‘record’ in genealogy. Put simply, a source is a collection/container of records. Some examples of a source are church registers, databases, authored genealogies, land deed books, vital record indexes and censuses. A source should also not be confused with a repository. A repository is a physical location where sources are held (for example the New Jersey State Archives). Original: the original form of the record created at the actual time of the event–or not long after. Derivative: the copied, aggregated, or derivative version of original records. Derivative sources are usually created well after the actual event. For example, an index of vital records. Note that a ‘copy’ does not refer to a photocopy of an original record. Authored works: the published research already conducted on the person/family/area of interest. As responsible genealogists, we want to seek out original sources when possible. Derivative sources and authored works are fantastic finding aids to locate original records. 1When we set out to answer a new research question, we make a list of all potentially relevant sources that might provide information to help answer our question. It’s critical that our list of potentially relevant sources also include sources that are likely to contain information which could contradict other information or disprove answers to our question. If you’re not already familiar with the location, time period, subject, etc. that you’re researching, this step will take some time. Records are the individual page, line item, certificate, etc. within a source that documents an event or action. Think of a death certificate. The source would be the actual collection of death certificates held at the particular repository, whereas the record would be the actual certificate of the person of interest. Looking at the death certificate, there is a lot of information from various informants. The information provided in our example death certificate is what’s actually written on the paper–not what may be inferred or what our opinions are. Primary: information/facts given by someone who was actually at the event. For example, the cause of death given by the medical examiner would be primary information. Secondary: information given by someone who was NOT physically at the event. This is information they may have heard or read elsewhere– it is hearsay. For example, the birth date of the deceased given by a spouse. Their spouse was not physically at the birth. Indeterminable: information given where the informant or how the informant knows the information cannot be determined. Now that we have an idea of the different types of information found in records, let’s look at how to evaluate the information by the evidence it provides. Evidence is our interpretation of the information contained in a record. It’s how we think about and use the information to help answer our research questions. Direct: evidence that directly answers our question. For example, the cause of death listed on a death certificate. Indirect: evidence that suggests an answer to our question, but does not directly answer it. More than one piece of indirect evidence will be needed to answer our question. 4Negative: evidence that does not exist where we assumed it would. This leads us to make assumptions about the missing information. For example, you might infer that a child missing from a census record of his/her family has died prior to the census year. Negative evidence should not be confused with negative findings. Evidence is ultimately what we are after to solve or prove our research question. Now that you have a better understanding of some basic terms, let’s dive into the GPS. Just how much evidence do you need? And how should it be organized? The GPS, was created to answer exactly those questions. Because every case is unique, we can’t establish a specific number and say, “You must have five indirect pieces of evidence.” In some cases, five isn’t enough. In others, it may only take two. Instead, the GPS sets standards that help you decide if you have enough evidence. 6 At times, many of us find research exhausting. But that doesn’t mean we’ve done exhaustive research. When it comes to GPS, this means that you’ve considered as many sources of potentially relevant information as possible within reason. You didn’t stop with just two or three bits of information and say good enough. You kept digging. This includes seeking out sources that are likely to contradict any preconceived conclusion you may have. Don’t just seek out the sources you know are likely to agree with your hypothesis. There are dozens of possible sources to be located. Some are original sources with primary information that offer direct evidence, and if you do manage to find them, wonderful. But if all you find are bits of indirect evidence, you need to look for every source you can get your hands on: probate and court records, census listings, newspaper articles, church records, local histories, etc. Each one adds a piece to the puzzle. This is also the step where you create your DNA testing plan. Remember, the results from your DNA test can offer a great deal of evidence. See our guide to DNA testing here. So how do I know when my research has met the standard of ‘reasonably exhaustive’? The very first step is to know what sources are available for the time and place you’re researching. Even when you know what sources are available, you won’t know you’ve been reasonably exhaustive until you’ve done the research – it’s impossible. You can plan all you’d like, but that initial batch of sources you plan to analyze should and will suggest other sources. Even once you’ve analyzed every source, I like to ask myself if I have enough evidence to make a conclusion that I feel confident won’t be overturned in the future if a new, contradictory source comes to light. If I don’t feel confident, then I must seek out new sources until I am confident. That’s reasonably exhaustive research – and yes it can be exhausting. For more on researching your ancestors in the United States, I highly recommend Val Greenwood’s book, The Researcher’s Guide to American Genealogy. When you do locate a source, record where you found it as completely and accurately as possible. This not only lets other researchers validate your information, but it makes it far easier for you to find the source again if you need to take another look. Don’t wait to document your sources. Write them down as you find them, and keep track of them in a single, centralized location. A proper source citation generally includes the name of the author, title of the source, a catalog or other identification number, publication date, page number, and date and place you accessed the source. Also, be sure to write down in which library, courthouse, archive, or other location you found it. And above all, ALWAYS make a copy of the title and/or section pages if your source has one. What may seem at first to be an original source of church marriage records might actually be a handwritten copy done years after the original which would make that source a derivative and thus less credible. I once spent days trying to resolve contradictory information in a church marriage register book. The marriage event took place in 1886, so I just assumed what I was looking at was written at that time. Only after pulling out my hair for days trying to resolve the issue did I think to go back to the title page of the book to realize it was not an original. It was a copy made in 1924 – 38 years after the event! So always make sure you understand and cite exactly what you’re looking at. For more on citations, I highly recommend reading Evidence Explained by Elizabeth Shown Mills. Just gathering evidence isn’t enough. 5You have to decide if your sources and information are reliable and useful, and then you must build a case. Not every source is reliable/credible. Just because you found it online or someone else said it was so, does not make it true. More often than not, user-created family trees on sites like Ancestry are littered with incorrect names, relationships, dates and any number of other facts. Don’t just copy what you see in someone else’s tree unless they have a documented trail of evidence. If you have five different pieces of information that imply five different years of birth for the person you’re researching, obviously at least four of them are wrong. Careful analysis of each piece of information and source is required to decide which is most likely to be accurate. Correlating sources means taking information from two or more sources and combining them to generate new knowledge. For example, say you don’t have a birth certificate for Michael Fleming, but you do for his brother Stephen. In another source, Stephen states that Michael is exactly three years and seventeen days younger than him. By correlating these two sources, you have some good indirect evidence to possibly prove Michael’s date of birth. Just remember you still need to perform reasonably exhaustive research and that the more indirect evidence you use (instead of direct), the more evidence is required to reach your conclusion. What happens when you have sources and information that contradict each other? When using the GPS, you can’t just ignore one and pick the other willy-nilly. Just because you see something you don’t think is true about your ancestor, doesn’t mean you can ignore it. Careful analysis is required. All conflicts must be resolved before you can prove your case. That’s not to say that every conflict can or will be resolved. Some may never be and you won’t be able to prove your conclusion without additional evidence. A large part of resolving a conflict is determining how or why a particular piece of information is wrong. Often this means digging up additional information. But once you can demonstrate that the contradictory information is not correct, you have resolved the conflict. Contradictions can be annoying. They force us to dig deeper and reason more carefully. But that is exactly what we should be doing anyway. If you cannot explain away the contradictory evidence, it will be impossible to build a convincing proof. For more on analysis and conflict resolution, I highly recommend Mastering Genealogical Proof by Thomas Jones. For some genealogists, writing a soundly reasoned and coherent conclusion is the hardest step. But it is also one of the most important and useful things that we can do. When building a proof using GPS, you assemble and link together all of the evidence that you found. You build a case that is sound and logical that leaves no conflict unresolved. Then you put it in writing. If you can’t write a coherent, soundly reasoned conclusion, chances are you still have more research to do first. If that’s the case, repeat step one of the GPS. Remember, not all research questions can be answered. Once you’ve written your conclusion, measure its completeness and credibility against the GPS. If all standards are met, you have proved your research question! Who Should Use the GPS? Professional genealogists rely on the GPS to ensure the work they do for their clients is of the highest quality. Anyone submitting a case study to a genealogical journal or magazine is certainly going to be expected to follow the GPS. But the more you use it in your everyday research, the better off you are going to be. Don’t wait until you’re ready to start preparing a written genealogy or family history. Use the GPS every step of the way. It will help guide your research and ensure you haven’t missed anything. It will make you more confident and secure in your conclusions, and keep you from constantly having to backtrack to verify information. In many cases, disproving something is much simpler than proving it. Is your friend actually descended from King Edward V? Ten seconds on Google will tell you that Edward V was never married and died when he was 12. Proving facts and connections when you don’t have direct evidence is tough, but the GPS is there to help you and guide you through the process. This guide was written to give you some baseline knowledge of the GPS and how important it is to use in your research. To learn more, I encourage you to pick up a copy of Genealogy Standards written by the Board for Certification of Genealogists. I also highly recommend reading Mastering Genealogical Proof by Thomas Jones and Evidence Explained by Elizabeth Shown Mills. Board for Certification of Genealogists. Genealogy Standards. 50th Anniversary Edition. Washington, D.C.: Ancestry, 2014. Shown Mills, Elizabeth, editor. “Professional Genealogy”: Preparation, Practice & Standards. Baltimore: Genealogical Publishing Co., 2017. Shown Mills, Elizabeth. Evidence Explained: Citing History Sources from Artifacts to Cyberspace. Third edition. Baltimore: Genealogical Publishing Co., 2017. I so wish I had found your site before I had started my search as I would have kept better records of how, where and when I found records pertaining to my family. I look forward to reading more on this site. Is this available for purchase as a poster? I use genealogy research to teach students history and analysis skills. It would be a great resource. Hi Pam. It’s not available as a poster. But that’s something I should look into if there’s enough interest. What size poster would be ideal for your needs? 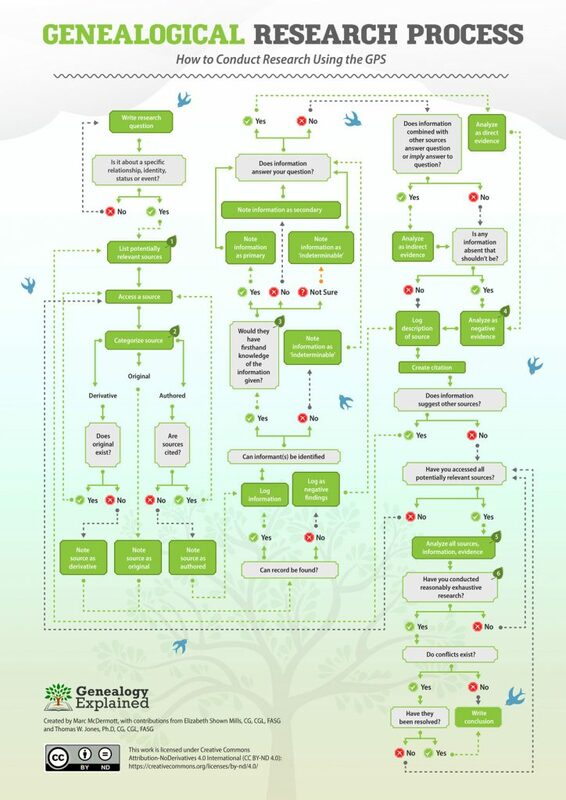 Is there a way to get a clearer copy of the flow chart. The copy I made from the site is blurry and hard to read. Hi Joseph. Click on the image to enlarge. It should be much clearer. Thank you for this graph and the explanation. I have seen to many bits of “research” that don’t follow through even the first few steps but are taken as truth. I need to do better at citations and research logs myself, but I do try to make sure my trees, online or offline, have a fairly comprehensive proof behind every name attached. I agree, please offer posters. Not overly large for my needs, just sturdy. I am very impressed. I have been doing my family history for 6 + years now and am still learning so much. Thank you for this article, very very informative. I think this would make a great poster as a reminder for everyone that a wiggling leaf is not a “proof”. 18 x 24 and 24 x 36? Thanks Robin, I am looking into this. WITH YOUR PERMISSION, and a clear image people can go to almost any office supply company and print their own poster. I just looked at Staples and not only can an online order be placed, there are also options to laminate and even add an easel in case someone wanted it free standing! May I have your permission to post your process flow chart reference graph in our Family History Center? Visuals raise the bar for quality research, and this is fabulous! Yes, please feel free. I’m also working on a printable poster-size version which should be available later this week. The poster file is now available! See the download form below the image. Your generous knowledge sharing with all us budding genealogists is an excellent example of how the profession will continue to grow and improve. I hope we all pay it forward. I requested the poster, but it never made it to my inbox. But I right-clicked the image and selected “Save image to” and got a jpeg on my computer, 10 x 14. This is big enough and handy enough for my purposes. Sorry about that, Ted. Let me know if you still need the larger one. Right-click and save will get you the low res version. For print, you’ll want the high res version instead.